This article will provide an overview of surgical interventions for obesity management as treatments for hyperglycemia in type 2 diabetes and as a mechanism of diabetes improvement and remission. Counseling tips and considerations when advising clients and patients on the most appropriate surgical procedure also will be discussed. The term "bariatric surgery" comes from the Greek words baros, which means "weight," and iatrikos, "the art of healing. "3 Bariatric surgery refers to any surgical procedure on the stomach or intestines to induce weight loss. "The term 'metabolic surgery' is most commonly used to describe someone who has bariatric surgery with diabetes; however, it also can be used to describe weight loss surgery in a patient who has prediabetes or [is] at risk of diabetes," says Kristen Smith, RDN, bariatric surgery coordinator for Piedmont Healthcare in Atlanta. The most common bariatric surgery procedures performed in the United States are gastric bypass, gastric sleeve (also called sleeve gastrectomy), and laparoscopic adjustable gastric band. A fourth surgery, biliopancreatic diversion with duodenal switch, is used less often and won't be discussed within the context of this article.6 Surgical options for weight loss include restrictive procedures and malabsorptive procedures. Each surgery has its advantages and disadvantages. "When undigested carbohydrates such as sugar reach the small intestine too quickly, extracellular fluid is drawn in to restore isotonicity, and in turn, the patient may experience dumping syndrome. Symptoms include sweating, bloating, cold sweats, tachycardia, emesis, dizziness, hypotension, diarrhea, and/or nausea," says Melissa Majumdar, MS, RD, CSOWM, LDN, CPT, nutrition coordinator at Brigham and Women's Hospital's Center for Metabolic and Bariatric Surgery in Boston. Late dumping occurs one to three hours after eating. Symptoms are related to reactive hypoglycemia (low blood sugar) and include sweating, shakiness, loss of concentration, hunger, and fainting.9 "Patients may experience reactive hypoglycemia if they have gone more than three to four hours without eating or if they have eaten a meal with refined carbohydrates, especially if the meal lacked protein," Majumdar says. Often referred to as sleeve gastrectomy or the sleeve, gastric sleeve surgery involves removing part of the stomach and leaving a thin, banana-shaped portion of the stomach connecting the esophagus to the pylorus. Sizing of the sleeve is based on a 32- to 36-French bougie, resulting in approximately 100 mL volume.8 A bougie is a measuring device used to guide the surgeon when dividing the stomach. Sleeve gastrectomy initially was used as a first-step bariatric procedure for high-risk patients or those with a BMI more than 60 kg/m2 to reduce the risk profile of patients. Once adequate weight loss occurred, a malabsorptive surgery often was performed.10 However, it was discovered that sleeve gastrectomy alone could cause significant weight loss before the second procedure. Metabolic surgery is associated with improvements in weight, glycemia, hepatic insulin and peripheral insulin resistance, insulin secretion, blood pressure, lipid profile, inflammation, end-organ damage, and diabetes remission. The increasing prevalence of bariatric surgery makes it likely that dietetics professionals will encounter patients pre- and postbariatric surgery. Following is a list providing best practices when counseling patients regarding bariatric surgery. • Understand the different metabolic weight loss procedures and who the ideal candidate is for each. According to the American Diabetes Association's Standards of Medical Care in Diabetes — 2018, appropriate surgical candidates are those with a BMI ≥40 kg/m2 (BMI ≥37.5 kg/m2 in Asian Americans), regardless of the level of glycemic control or complexity of glucose-lowering regimens, and in adults with BMI 35 to 39.9 kg/m2 (BMI 32.5 to 37.4 kg/m2 in Asian Americans) when hyperglycemia is inadequately controlled despite lifestyle and optimal medical therapy. Metabolic surgery should be considered as an option for adults with type 2 diabetes and BMI 30 to 34.9 kg/m2 (BMI 27.5 to 32.4 kg/m2 in Asian Americans) if hyperglycemia is inadequately controlled despite optimal medical therapy by either oral or injectable medications (including insulin). Majumdar says, "From a dietitian's perspective, the ideal candidate is looking for an opportunity to change their life using the tool of metabolic surgery along with the support of their fellow patients and the education and support of the surgery program. An ideal candidate uses surgery as a springboard to adjust diet and lifestyle and possibly change their whole family's take on food and nutrition. They take control of their hunger through the hormonal and appetite adjustments surgery provides and, in the meantime, increase activity and face nonhunger reasons for eating head on." • Educate clients who choose Roux-en-Y gastric bypass on risk and prevention of dumping syndrome—a common side effect—and hypoglycemia. Majumdar helps her patients understand the "blood sugar roller coaster" that may occur if they go too long without eating or if they eat refined carbohydrates. "The patient should be encouraged to include protein and fiber at all eating events, spacing meals and snacks to every three to four hours," Majumdar says. "If patients are in the habit of forgetting meals, we may use reminder techniques such as timers or apps; we will also discuss snacks and meals for emergencies (shelf-stable foods, protein shakes/bars), and on-the-go eating." Dumping can occur from consuming added sugars and drinking fluids with meals; however, Majumdar says it's less likely to be the result of consumption of natural sugars such as fruit, milk, and yogurt. "We advise patients to look for protein shakes with less than 20 g total sugar (from added and total sugars), limit added sugars, and choose products with more protein and fiber compared to sugar," says Majumdar, who also encourages patients to wait 30 minutes after eating before drinking to prevent dumping. Clients also should be informed about other common complaints after surgery, such as nausea, vomiting, anorexia, dehydration, halitosis, constipation, diarrhea, flatulence, and lactose intolerance. • Meet clients where they are. 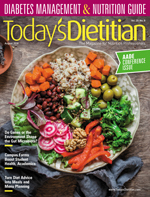 "Registered dietitians must avoid being 'food police' and establish an approachable environment for lifelong follow-up," Smith says. She suggests offering a long-term support system using a variety of techniques, "whether that's through support groups, check-in telephone calls, or individual counseling sessions." • Treat both conditions—diabetes and bariatric surgery. Don't assume the patient understands how to manage diabetes. "I sometimes assume a patient has been educated on diabetes and proper eating but find the patient munching on candy to keep blood sugars from falling or drinking juice daily," Majumdar says. "Starting with a clean slate and educating on how making changes in preparation for surgery or postop can help both with surgery success and blood sugar control." • Check for vitamin deficiencies, as people with morbid obesity have a higher risk of developing them. Studies have shown that 55% to 80% of those with morbid obesity possibly have a vitamin D deficiency, and nearly 50% of patients seeking bariatric surgery have iron deficiency. Vitamin B12 and thiamin deficiencies also have been identified in bariatric surgery candidates. Majumdar suggests nutrition professionals "look closer for deficiencies such as B12 or other B vitamins in patients with diabetes who have been on metformin, both preoperatively and postop." — Constance Brown-Riggs, MSEd, RD, CDE, CDN, is a national speaker and coauthor of the Diabetes Guide to Enjoying Foods of the World, a convenient guide to help people with diabetes enjoy all the flavors of the world while still following a healthful meal plan. 1. Type 2 diabetes and obesity: twin epidemics. American Society for Metabolic and Bariatric Surgery website. https://asmbs.org/resources/weight-and-type-2-diabetes-after-bariatric-surgery-fact-sheet. Published November 2013. Accessed June 4, 2018. 2. American Diabetes Association. Obesity management for the treatment of type 2 diabetes: standards of medical care in diabetes — 2018. Diabetes Care. 2018;41(Suppl 1):S65-S72. 3. Pinkney J, Kerrigan D. Current status of bariatric surgery in the treatment of type 2 diabetes. Obes Rev. 2004;5(1):69-78. 4. Lee WJ, Almalki O. Recent advancements in bariatric/metabolic surgery. Ann Gastroenterol Surg. 2017;1(3):171-179. 5. Lager CJ, Esfandiari NH, Subauste AR, et al. Roux-en-Y gastric bypass vs. sleeve gastrectomy: balancing the risks of surgery with the benefits of weight loss. Obes Surg. 2017;27(1):154-161. 6. Types of bariatric surgery. National Institute of Diabetes and Digestive and Kidney Diseases website. https://www.niddk.nih.gov/health-information/weight-management/bariatric-surgery/types. Updated July 2016. Accessed June 5, 2018. 7. Laparoscopic gastric bypass. University of California San Francisco Bariatric Surgery Center website. https://bariatric.surgery.ucsf.edu/conditions--procedures/laparoscopic-gastric-bypass.aspx. Accessed June 5, 2018. 8. Tham JC, Howes N, le Roux CW. The role of bariatric surgery in the treatment of diabetes. Ther Adv Chronic Dis. 2014;5(3):149-157. 9. Bariatric surgery: postoperative concerns. American Society for Metabolic and Bariatric Surgery website. https://asmbs.org/resources/bariatric-surgery-postoperative-concerns-2. Updated February 7, 2008. Accessed June 16, 2018. 10. Manchester S, Roye GD. Bariatric surgery: an overview for dietetics professionals. Nutr Today. 2011;46(6):264-273. 11. Schauer PR, Mingrone G, Ikramuddin S, Wolfe B. Clinical outcomes of metabolic surgery: efficacy of glycemic control, weight loss, and remission of diabetes. Diabetes Care. 2016;39(6):902-911. 12. Sjöström L, Peltonen M, Jacobson P, et al. Bariatric surgery and long-term cardiovascular events. JAMA. 2012;307(1):56-65.